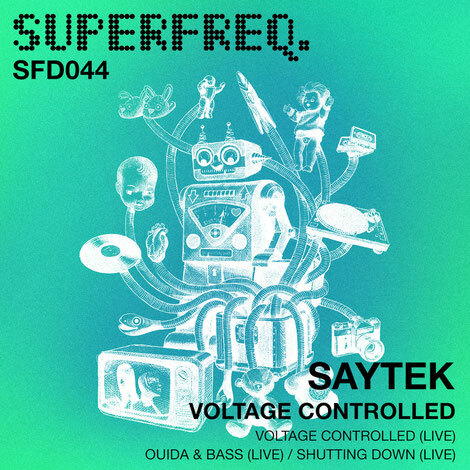 Superfreq will kick off 2018 with the second in a series of EPs from Saytek. Hot on the heels of his release in October, it is another offering of tracks all edited down from live and impromptu jam sessions. Having cut his teeth as a young clubber and producer at many of Superfreq boss Mr.C’s parties, Saytek has possibly become one of the electronic music scene’s most in-demand live acts. Named ‘one of the UK’s freshest and exciting acts’ by Carl Cox and after a recent BBC Radio One live session that was apparently well received, Saytek writes, produces and performs everything live on the fly, using a myriad of machines and effects. He has released on labels like Bedrock, Marshall Jefferson’s Freakin303 and Kevin Saunderson’s KMS, and again demonstrates his inventiveness and studio trickery. ‘Voltage Controlled’ goes first and hits hard right out of the blocks. It’s wired up with sinewy synths and warmed through with soulful chords as hard hitting drums pound away. ‘Ouida & Bass’ is a tribal tinged track with vocal chanting and lumpy kick drums bouncing away throughout. Huge hi hats and chattering claps add to the overall rush. Last but not least, ‘Shutting Down’ is a freaky nine minutes track with real percussive energy, dark bass and distant howling voices. It’s a cantering techno groove with evocative imagery and bubbles up throughout, keeping you on edge.